Ted Ely spreads his time among multiple organizations. He's a board member of JazzErie's parent orgnaization, the Erie Art Museum, remains active with the Erie Philharmonic, and stepped up from Vice President to President of JazzErie in late 2011. 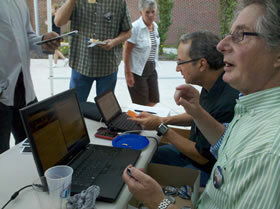 In the photo to the right, Ted and his good friend, Rich Giardina, who serves as treasurer, coordinated button sales at the 2011 Jazz & Blues Walk. Ted reflected on how he came to appreciate jazz, and answered a question many of us have faced - if you think you don't know anything about jazz, where do you begin.